determination of the purity of a substance or the amount of any particular constituent of a mixture. biological assay bioassay; determination of the potency of a drug or other substance by comparing the effects it has on animals with those of a reference standard. CH50 assay a test of total complement activity as the capacity of serum to lyse a standard preparation of sheep red blood cells coated with antisheep erythrocyte antibody. The reciprocal of the dilution of serum that lyses 50 per cent of the erythrocytes is the whole complement titer in CH50 units per milliliter of serum. enzyme-linked immunosorbent assay (ELISA) any enzyme immunoassay using an enzyme-labeled immunoreactant (antigen or antibody) and an immunoadsorbent (antigen or antibody bound to a solid support). A variety of methods are used for measuring the unknown concentration, such as either competitive binding between the labeled reactant and unlabeled unknown or a sandwich technique in which the unknown antigen binds both the immunoadsorbent and labeled antibody. One of the uses of ELISA is to screen blood for antibody to the human immunodeficiency virus; a positive result indicates probable exposure to the virus and possibly that the virus is in the blood. Since false-positives can occur, a back-up test is used to confirm positive findings. ELISA: With antigen capture ELISA, the wells are coated with antibody to the virus. 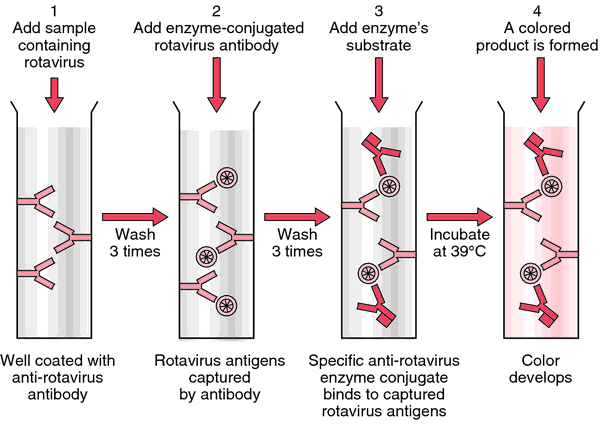 The sample containing virus (1) is added and, after washing several times, enzyme conjugated to an antibody to the virus is added (2). Finally, after a further cycle of washing, the enzyme's substrate (3) is added. A colored product is formed if the viral antigen is present in the sample (4). From Hart and Shears, 1997.
microhemagglutination assay–Treponema pallidum (MHA-TP) a Treponema pallidum hemagglutination assay using microtechniques; used in the detection of syphilis. radioreceptor assay a radioligand assay in which a radiolabeled hormone is used to measure the concentration of specific cellular receptors for the hormone in tissue specimens, an example being radioassay of estrogen receptors in breast tissue. thyroid-stimulating hormone assay thyroid-stimulating hormone test. Treponema pallidum hemagglutination assay (TPHA) a treponemal antigen serologic test for syphilis using tanned sheep red blood cells coated with antigen from the Nichol's strain of Treponema pallidum and treated patient serum; it is similar in sensitivity and specificity to the FTA-ABS test. This test is not useful for individuals who have had syphilis in the past. TSH assay thyroid-stimulating hormone test. Acronym for enzyme-linked immunosorbent assay. (e-li´sah) Enzyme-Linked Immuno-Sorbent Assay; any enzyme immunoassay using an enzyme-labeled immunoreactant and an immunosorbent. A sensitive immunoassay that uses an enzyme linked to an antibody or antigen as a marker for the detection of a specific protein, especially an antigen or antibody. It is often used as a diagnostic test to determine exposure to a particular infectious agent, such as the AIDS virus, by identifying antibodies present in a blood sample. abbreviation for enzyme-linked immunosorbent assay, a technology used to measure a variety of proteins and antigens. Enzyme-linked immunosorbent assay Lab medicine A heterogeneous immunoenzymatic assay that approaches the sensitivity of RIA Pros Lower cost, simpler equipment, faster 'turn-around time', and none of the problems inherent in handling radioactive substances; ELISA may be used to measure any antigen and antibody. See Avidin-biotin method, EMIT, RIA, Sandwich method. Abbreviation for enzyme-linked immunosorbent assay. Enzyme-linked immunosorbent assay. This test has been used a screening test for AIDS for many years and has also been used to detect gonorrhea bacteria. n.pr See enzyme-linked immunosorbent assay. n the abbreviation for enzyme-linked immunosorbent assay used to detect the presence of HIV antibody to HIV in the blood. See also EIA. enzyme-linked immunosorbent assay. A type of primary binding test used to detect and measure either antigen or antibody. Either antigen or antibody is bound to a solid substrate (polystyrene surface), and a second antibody to which enzyme is conjugated is added, followed by a substrate for the enzyme. The stool antigen test for detection of Helicobacter pylori after eradication therapy. A screening trial of Helicobacter pylori-specific antigen test in saliva to identify an oral infection. Imipenem/cilastatin by Hospira was the only medication that produced a positive galactomannan antigen test. Applicability of a rapid stool antigen test, using monoclonal antibody to catalase, for the management of Helicobacter pylori infection. The sensitivity of the antigen test is 86-100%, and the specificity approaches 100%. The CBCS compared to the antigen test showed a sensitivity of 93. However, antigen test in NS in all infants was very cost-effective in preventing unnecessary antibiotic therapy. New cause for false-positive results with the cryptococcal antigen test by latex agglutination. capsulatum antigen test (MiraVista laboratories, Indianapolis, USA) for diagnosis of incident disease. That means any approach--rapid antigen test or culture, or empiric treatment or not--can be justified, said Dr.
Immunofluorescence test for sensitive detection of varicella-zoster virus-specific IgG: an alternative to fluorescent antibody to membrane antigen test. In those patients, he would order a urinary antigen test for Legionella species, because of its virulence and because it is a public health problem, and perhaps a urinary antigen test for pneumococcus, to pick up bacteremia.